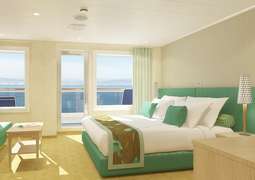 The Carnival Breeze set sail on June 3, 2012. This ship is designed in a unique Caribbean style. A high ropes course and a waterpark are only a small taste of what is to come. 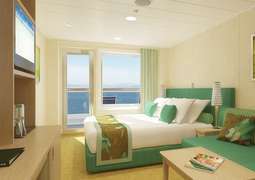 The cabins and suites of the Carnival Breeze will enchant you with their new Caribbean flair. 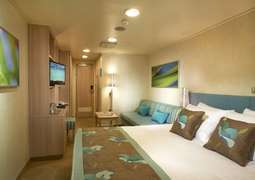 Inner, outer and balcony cabins, as well as luxury suites and Cloud 9 Spa cabins guarantee a perfect home away from home for all guests. The Spa cabins combine the exclusive benefits of the Cloud 9 Spa area with different cabin categories. A 24-hour room service is always at the ready to attend to your every need. You are always free to choose where and when you would like to dine. Feel free to choose between a variety of different restaurants and bistros with numerous new menu offerings. Indulge in culinary delights in the Steak House, Bistro and the À la Carte restaurant. Some of the finest international cuisine can be found in the Indian Tandoor Oven, the Mongolian Wok or at the Italian pasta bar. A special highlight of the bars, clubs and lounges on board is the RedFrog Pub, where you can wind down the day with a refreshing glass of Thirsty RedFrog-- the pub's self-brewed beer. The Carnival Breeze is also known as a 'fun ship', as fun and excitement is promised day and night. The WaterWorks Waterpark with gigantic water slides and many different swimming pools guarantees water fun at its best. A special highlight is the spectacular high ropes course on deck. Furthermore you can watch movies directly from the pool thanks to the luxury of an outdoor screen. Have some family time at the mini golf course and basketball court, or enjoy the view while taking a jog on the outdoor athletic track. Furthermore you will find an internet café, casino and a Serenity area that is reserved for adults only. There you can relax while the younger guests on board enjoy entertainment in the ‘Camp Carnival’ play area. Teenagers are welcome to hang out in the Club 02 with parties, video games and much more. Evenings are filled with great live music, fantastic shows from the Las Vegas strip, comedy and karaoke. The fitness centre on board is equipped with steppers, treadmills, bicycles and many other modern exercise machines. Diverse fitness courses are also offered. Let yourself be pampered with everything from manicures to massages in the salon and the Cloud 9 Spa area, where you can also find a thalasso pool, tropical shower and different aromatic baths. As a relaxing atmosphere is the first priority of Carnival Cruise Lines, the dress code on board is casual and comfortable. The evening dress code is generally unrestrained. There will be formal occasions for which cocktail dresses and nice shirts with ties are recommended, though guests who would prefer not to participate in such events are welcome to dine in the casual atmosphere of a self-service restaurant.